Military Boots Direct is an authorized dealer and NOT directly affiliated with Belleville Shoe Inc nor a subsidary of its brands. 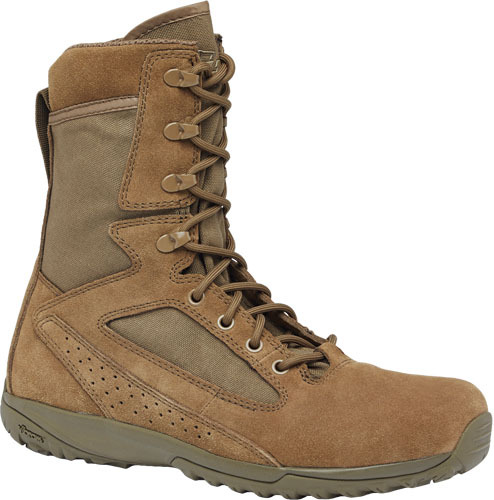 The Tactical Research Men's Transition boot was made for soldiers transitioning from conventional military boots to minimalist footwear. This boot adds underfoot cushioning and shock minimizing materials over the popular MiniMil boot series. 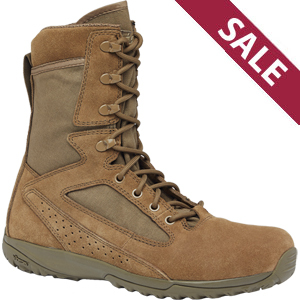 The TR115 comes in olive tan as a training boot for the USMC personnel and has an unlined upper for hot weather. It features a full 8inch military height and intermediate 6mm heel to toe drop. It is reinforced with double and triple stitching in the most critical areas of the boots to give excellent durability. Copyright © 2017 Militarybootsdirect.com. All Rights Reserved.